Baños de Agua Santa or simply Baños is an Ecuadorian city, of the Province of Tungurahua. It is a tourist center of importance of the country, is located about 45 minutes from Ambato. It is the cantonal head of the canton Baños and has a population of 12,995 people. The most important economic activity of the canton is the receptive tourism. The WWF gave the nominative to Baños of "A Gift for Earth"
Baños, is located in the foothills of the Tungurahua volcano at an altitude of 1820 meters (msnm), very close to the geometric center of the Ecuadorian territory. It enjoys a very pleasant climate, almost all year round; Despite high humidity. The national parks Sangay and Llanganates. Are located on the flanks of the canton. Baños is also a religious pilgrimage center as the hot springs are popularly associated with "miraculous" cures because of the influence of the Dominican community that has been settled in this area for a long time. The oldest Spanish chronicles refer to the populations of this region as inhabitants who spoke the languages ​​Puruhaes and Panzaleos, the ancestral name of the Valley was Ipo (in the Puruha language). The population of the valley was not stable and there were also Quichua groups. From the 15th, 16th and 17th centuries, there are very few original written historical data, among which we can mention the following: In 1541 Father Vacas Galindo recounts the arrival of Gonzalo Díaz de Pineda, Martin de la Calle, Alonso de Orejuela together with a contingent of Spanish soldiers, who were accompanied by huambaloes Indians, who had indicated to them that in the skirts of the Tungurahua existed a silver mine. These conquistadors, ambitious for riches, are made to assign these lands for their exploitation, along with other relatives of them, by the Cabildo of San Francisco de Quito. Fortunately, the desire to find gold, in the country of El Dorado (expeditions by Baeza), made these gentlemen of these supposed mines to be forgotten. The chronicler Isaías Toro Ruiz, tells us that in 1585. Pedro Fernandez de Espinoza gives ownership to the presbyter Álvaro Guerrero Zalamea, the chief of the IPO. This religious comes to take possession of this land and calls it Estancia de Nuestra Senora de Monserratte. This man comes along with Alonso Guerrero, who takes possession of what would be called Hacienda de San José de Juivi. These two partners also set up an indigo factory in these places. It is assumed that it was Alvaro Guerrero who started with the cult of the Virgin Mary, and it is in these years when the famous Ermita de la Virgen was built. Pilar Ponce Leiva (Archivo de Indias), tells us a chronicle dating from 1604, in which he states that when they arrive at this point called "Seat of the Baños", since 8 blocks from the tiny village, at the foot of A waterfall, were 2 water sources (cununyacus), they find as inhabitants 40 freighters and a few Spaniards, who bathe in these waters (a hot and a cold pool, which mix them). For the Indians to enjoy this water they call it ishpaypae which means to bathe in the middle of Mama Tungurahua. Almost next to these slopes, we are told, there is a small adobe church with a thatched roof (La Ermita de la Virgen). "It's really Los Baños, a place of waters to which people from all over the province come, pilgrims and important people, there are about 300 souls who live in almost all of them in miserable little houses of straw, almost all of them are mestizos. Near the village passes the Rio Grande de los Baños (Pastaza from 1778. Longitude to the Amazon 643 km) . His little church burned down to produce a great miracle, as the image of the Virgin's wood remained intact. The faithful set out to build a new temple and are building a church of lime and stone "(which was completed in 1788) on February 4, 1773, the first eruption of Tungurahua historically described.A catastrophe for Baños and its surroundings Before this eruption, several chroniclers and historians, among them Father Juan de Velasco, affirm that the volcano had the form of a pyramid finished in a well pronounced tip, which makes to suppose that the crater that we know today begins to form with The lava flows through one of the channels of the Bascun that went through what is now Martínez Street and reaches the gates of the river. Hermitage of the Virgin that was somewhat rebuilt since its last fire.These years begin to visit Baños characters such as Pedro Vicente Maldonado and the First Marquis of Selva Alegre, Montufar and Fra Zo. The chronicler Isaías Toro Ruiz, relates that in 1585, the encomendero Pedro Fernandez de Espinoza cedes property to the priest Álvaro Guerrero Zalamea, the chief of Ipo. This religious takes possession of the lands of the valley and calls them Estancia (hacienda) of Our Lady of Monserratte. Simultaneously another encomendero Alonso Guerrero takes possession of an area that denominates Hacienda de San José de Juivi. These people also associated themselves to install a factory for the preparation of indigo. It is presumed that they were also the initiators of the cult of the Virgin Mary in these places. In 1694, these lands were titled to the Spanish General Antonio Palomino Flores (owner of the Haciendas San Jose de Juivi and San Vicente, of which the Baths of that time were composed) pacta with the representatives of the clergy and it undertakes to give each Year the sum of 3,000 pesos for the chaplaincy and for the support of a priest. During the second half of the nineteenth century, there were many political conflicts and civil wars nationwide, Baños became an oasis of neutrality and refuge for both conservatives and liberals, including Juan Montalvo (Hacienda de Puntzán). Many Colombian immigrants take possession of lands and estates in the sector with the approval of President Garcia Moreno, among others the families Romo, Erazo, González, Fierro and Argoti. Notable estates in the surroundings of the town were: Ulba, Ulbilla, Valencia, Vizcaya, Agoyán, Puntzán, San Vicente, Illuchi, Juivi. The population of Baños was divided at the beginning of the century between hacendados and rural workers. In 1887 the Belgian priest Tomás Halflants, a person who also assumed the functions of mayor and made possible the development of many works, among them the delineation of the streets of the city, the construction of the bridges of San Francisco, El Topo, San Martín y las Juntas, the first water catchments in Chigla, reconstruction of the old church, building of the Basilica of the Virgin (1904-1944) and the acquisition of the bronze pool in the Plaza de El Higuerón . In 1909 he was succeeded by the Belgian priest Van Shoote. This influenced the religious character of the population. From 1916 to 1920 occurs the second contemporary eruption of the Tungurahua, in 1918 a great explosion takes place that shakes the earth in Riobamba, lahares and lava go down until Nahuazo. It rains on that day and ash in all that time. In 1928, President Isidro Ayora, builds the old Ambato - Baños road, consolidating itself as the main access to the Amazon Region of Ecuador. On December 16, 1944 was officially founded the Canton Baths; The First President of the Cantonal Council was Pedro Tomás Vargas and the First President elected in popular votes was Carlos González. The earthquake of Ambato of August 5, 1949 seriously affected Baños, reducing to rubble almost all the buildings of the city. The population declined drastically, there were many dead and much of the survivors left the city. In 1999 the Tungurahua volcano was activated; And the population of Baños was totally evacuated. Since that year, the Tungurahua is still active with large eruptions in 1999, 2000 and 2006. Located on the outer flanks of the Andes, in the foothills of the Tungurahua volcano, at an altitude of 1820 masl. It is located 40 km east of Ambato, in the province of Tungurahua. It has a great hydrological wealth, with some rivers in its vicinity, such as the Bascún river (west), the river Ulba (east of the city) The Pastaza river that limits the city to the south. 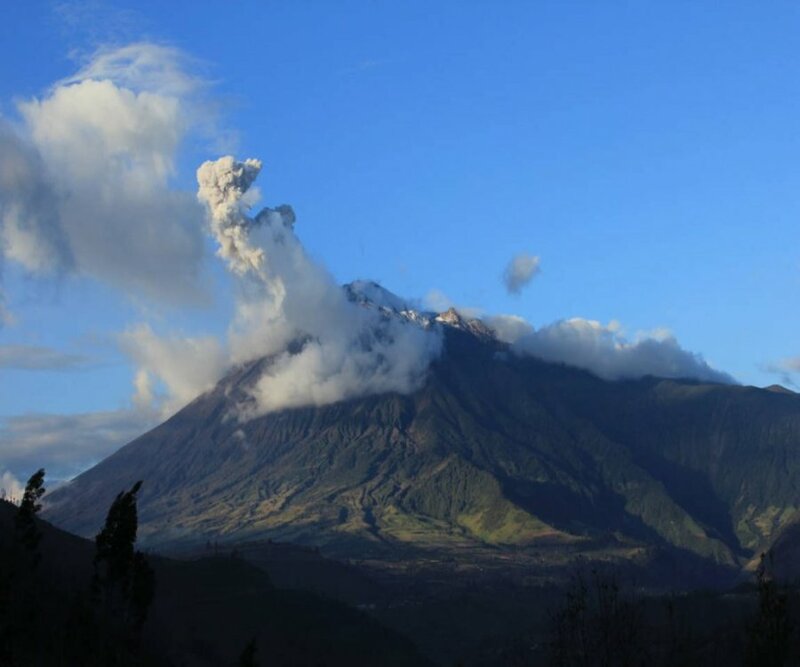 The Tungurahua volcano and the rest of the elevations that surround the city cover Baños of the strong winds. It is a tropical rainy climate zone, its usual temperature is about 15 to 25 ° C in summer.